Mindfulness training has been shown to improve health and well-being. It has also been found to be effective for a large array of medical and psychiatric conditions, either stand-alone or in combination with more traditional therapies. As a result, mindfulness training has been called the third wave of therapies. One problem with understanding mindfulness effects is that there are, a wide variety of methods to measure mindfulness most of which involve subjective answers to questions from the practitioner. There is a need for more objective measures. Focused attention meditation is a mindfulness training technique that involves paying attention to a single meditation object, frequently the breath, counting each in breath and each out breath. This breath following meditation practice is easy to observe and quantify with a breath counting test and may serve as an objective measure of the development of mindfulness. In today’s Research News article “Towards an Objective Measure of Mindfulness: Replicating and Extending the Features of the Breath-Counting Task.” (See summary below or view the full text of the study at: https://www.ncbi.nlm.nih.gov/pmc/articles/PMC6153891/ ), Wong and colleagues recruited college students and had them complete a 20-minute breath counting task, a 20-minute vigilance task, and mindfulness, cognitive failures, and mind wandering questionnaires. On a second occasion the participants completed a second 20-minute breath counting task. In the breath counting task the participants pushed a button after each breath while their actual breathing was measured. They found that 72% of the breaths were accurately counted but participants were significantly poorer during the second 10 minutes of the task than the first 10 minutes. The results of the first breath counting task were highly correlated with the results of the second, suggesting high reliability of measurement with the task. They also found that the higher the breath counting accuracy, the higher was the accuracy and the fewer the errors in the vigilance (attentional) task and the fewer the cognitive failures reported in everyday life. Finally, there was a trend toward higher breath counting accuracy being associated with higher subjective mindfulness. These results suggest that the breath counting task may be a useful objective measure of mindfulness that has high reliability. It correlates with sustained attentional ability (vigilance) and also with subjective mindfulness. Further research is needed to determine if this is a better measure of mindfulness for use in research and therapeutic interventions. One potential way to look at this is to see if breath counting accuracy increases after mindfulness training and better predicts other outcomes of mindfulness practice. So, breath counting may be an objective measure of mindfulness. F Wong, K., A A Massar, S., Chee, M., & Lim, J. (2018). Towards an Objective Measure of Mindfulness: Replicating and Extending the Features of the Breath-Counting Task. Mindfulness, 9(5), 1402-1410. Despite calls for objective measures of mindfulness to be adopted in the field, such practices have not yet become established. Recently, a breath-counting task (BCT) was proposed as a reliable and valid candidate for such an instrument. In this study, we show that the psychometric properties of the BCT are reproducible in a sample of 127 Asian undergraduates. Specifically, accuracy on the BCT was associated with everyday lapses and sustained attention, and weakly associated with subjectively measured mindfulness. BCT metrics also showed good test-retest reliability. Extending the use of the paradigm, we further found that two different types of task errors—miscounts and resets—were correlated with different aspects of cognition. Miscounts, or errors made without awareness, were associated with attentional lapses, whereas resets, or self-caught errors, were associated with mind-wandering. The BCT may be a suitable candidate for the standardized measurement of mindfulness that could be used in addition to mindfulness questionnaires. “…In focused attention or concentration meditation, you direct your attention to a chosen object, such as the sensation of the breath entering and leaving your nostrils, and you keep your attention focused on that object from moment to moment. Two in particular types of meditation can be characterized on a continuum with the degree and type of attentional focus. In focused attention meditation, the individual practices paying attention to a single meditation object, learns to filter out distracting stimuli, including thoughts, and learns to stay focused on the present moment, filtering out thoughts centered around the past or future. In open monitoring meditation, the individual opens up awareness to everything that’s being experienced regardless of its origin. These include bodily sensations, external stimuli, and even thoughts. The meditator just observes these thoughts and lets them arise and fall away without paying them any further attention. These techniques have common properties of restful attention on the present moment, but there are large differences. These differences are likely to produce different effects on the practitioners, their psychology and their brains. The nervous system is a dynamic entity, constantly changing and adapting to the environment. It will change size, activity, and connectivity in response to experience. These changes in the brain are called neuroplasticity. Over the last decade neuroscience has been studying the effects of contemplative practices on the brain and has identified neuroplastic changes in widespread area. and has found that meditation practice appears to mold and change the brain. In today’s Research News article “Open monitoring meditation reduces the involvement of brain regions related to memory function.” (See summary below or view the full text of the study at: https://www.ncbi.nlm.nih.gov/pmc/articles/PMC6028418/ ), Fujino and colleagues recruited experienced meditators and scanned their brains for functional connectivity between structures with functional Magnetic Resonance Imaging (f-MRI) while they were engaging in open monitoring meditation, and again when engaging in focused attention meditation. Each f-MRI session was preceded by a week of practicing the appropriate meditation type at home. They found that both meditation types produced decreased functional connectivity between the striatum, a component of the attention neural network and the posterior cingulate cortex a component of the Default Mode Network that is usually active during mind wandering. These findings suggest that both techniques help keep the mind focused and successfully suppress the mind straying from the task at hand. 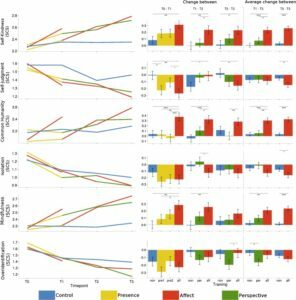 The meditation techniques also produced differences in functional connectivity with open monitoring meditation reducing functional connectivity of the ventral striatum with both the visual cortex and retrosplenial cortex while focused attention meditation increasing this connectivity. In some ways this is not surprising as the striatum – visual cortex connection is thought to be involved in intentional focused attention. It would be expected that focused attention meditation would strengthen this while open monitoring meditation would weaken it. In addition, the visual cortex is thought to be involved in memory. This suggests that open monitoring meditation may reduce the tendency to have memories interjected into the meditation practice. So, the results are suggestive of similar effects of open monitoring meditation and focused attention meditation on the brain systems maintaining attention and suppressing mind wandering and differing effects on the brain system underlying focused attention and memory. These differing neural changes suggest that the two practices produce different experiential effects on the individual during practice. “Open monitoring meditation is known to make you more creative. And if you feel as though you are stuck in a rut or as though you need to find alternative solutions to problems, then this can be a very effective techniques to use. Mindfulness meditation consists of focused attention meditation (FAM) and open monitoring meditation (OMM), both of which reduce activation of the default mode network (DMN) and mind-wandering. Although it is known that FAM requires intentional focused attention, the mechanisms of OMM remain largely unknown. To investigate this, we examined striatal functional connectivity in 17 experienced meditators (mean total practice hours = 920.6) during pre-resting, meditation, and post-resting states comparing OMM with FAM, using functional magnetic resonance imaging. Both FAM and OMM reduced functional connectivity between the striatum and posterior cingulate cortex, which is a core hub region of the DMN. Furthermore, OMM reduced functional connectivity of the ventral striatum with both the visual cortex related to intentional focused attention in the attentional network and retrosplenial cortex related to memory function in the DMN. In contrast, FAM increased functional connectivity in these regions. Our findings suggest that OMM reduces intentional focused attention and increases detachment from autobiographical memory. This detachment may play an important role in non-judgmental and non-reactive attitude during OMM. These findings provide new insights into the mechanisms underlying the contribution of OMM to well-being and happiness. In today’s Research News article “Differential Effects of Attention-, Compassion-, and Socio-Cognitively Based Mental Practices on Self-Reports of Mindfulness and Compassion.” (See summary below or view the full text of the study at: https://www.ncbi.nlm.nih.gov/pmc/articles/PMC5693975/ ), the effects of the various meditation techniques on mindfulness and compassion were compared. 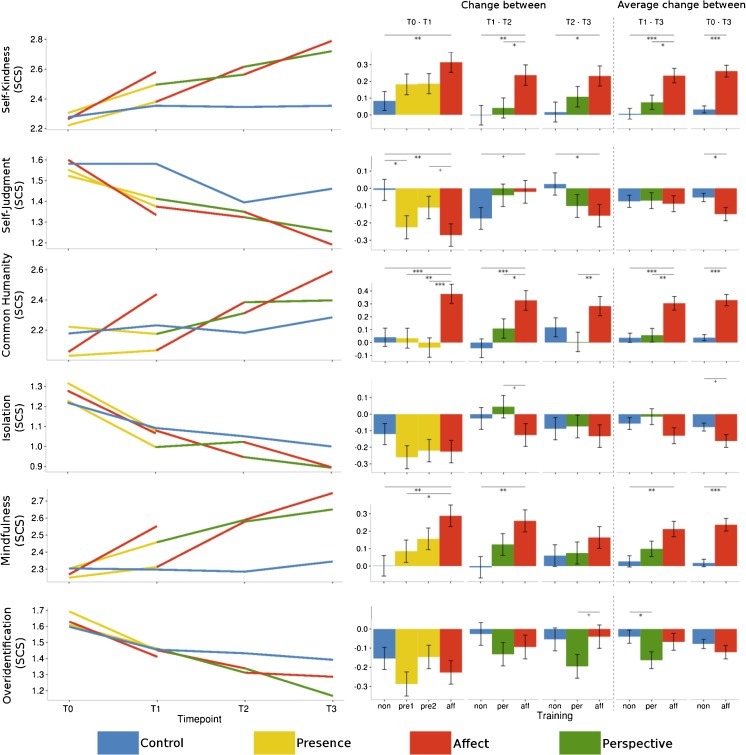 Hildebrandt and colleagues recruited healthy adults without meditation experience and randomly assigned them to one of two conditions; the first practiced “Presence”, “Affect”, and “Perspective” conditions in counterbalanced order, while the second constituted a retest control. The conditions were practiced daily at home for 13 weeks and involved a weekly 2-hour training session. In the “Presence” condition the participants practiced as focused attention meditation and body scan meditation In the “Affect” condition the participants practiced Loving Kindness Meditation and engaged in affect dyads, where they were paired with another participant to discuss for 5 minutes each day something that they were grateful for, In the “Perspective” condition the participants practiced observing thoughts meditation and engaged in perspective dyads, where they were paired with another participant to discuss for 5 minutes each day “a situation from the perspective of one of one’s own inner parts.” The retest control participants were matched on mindfulness with the practice participants. All participants were measured before and after each condition for mindfulness, compassion, fear of compassion, and self-compassion. They found that, compared to the retest control condition all three meditation conditions led to increased mindfulness presence, observing, and non-reacting, but only the “Affect” and “Perspective” conditions produced significant increases in the mindfulness non-judging, accepting, and compassion scales. The “Affect” condition produced additional significant increases in the compassion scales. Hence, different mindfulness practices produced different patterns of change in mindfulness and compassion. Practicing focused meditation appears to improve present moment awareness and the ability to not react to its contents. Practicing observing thoughts appeared to not only improve these mindfulness components but also improved the ability to accept and not judge what is occurring. On the other hand, practicing Loving Kindness Meditation appears to improve all of these mindfulness components and in addition improve compassion. Hence, it appears that “Affect” meditation may be a superior technique for promoting both mindfulness and compassion. These results are surprising as focused attention meditation has long been the most commonly taught practice, yet it was the least effective. It should be mentioned, however, that the present study was unusual in including dyadic discussions in only the “Affect” and “Perspective” conditions and not the “Presence” condition. These dyadic discussions may have been crucial in producing the enhanced effectiveness’ of these practices. It remains for future research to investigate this possibility. This study is an important beginning in documenting the different effects of different meditation techniques. This may lead to better application of meditation tailored for the specific needs of the individual, leading to improved health and well-being. Research on the effects of mindfulness- and compassion-based interventions is flourishing along with self-report scales to assess facets of these broad concepts. However, debates remain as to which mental practices are most appropriate to develop the attentional, cognitive, and socio-affective facets of mindfulness and compassion. One crucial question is whether present-moment, attention-focused mindfulness practices are sufficient to induce a cascade of changes across the different proposed facets of mindfulness, including nonjudgmental acceptance, as well as compassion or whether explicit socio-affective training is required. Here, we address these questions in the context of a 9-month longitudinal study (the ReSource Project) by examining the differential effects of three different 3-month mental training modules on subscales of mindfulness and compassion questionnaires. The “Presence” module, which aimed at cultivating present-moment-focused attention and body awareness, led to increases in the observing, nonreacting, and presence subscales, but not to increases in acceptance or nonjudging. These latter facets benefitted from specific cultivation through the socio-cognitive “Perspective” module and socio-affective, compassion-based “Affect” module, respectively. These modules also led to further increases in scores on the subscales affected by the Presence module. Moreover, scores on the compassion scales were uniquely influenced by the Affect module. 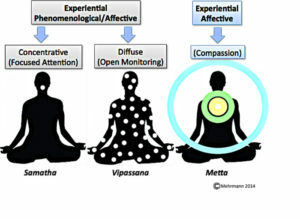 Thus, whereas a present-moment attention-focused training, as implemented in many mindfulness-based programs, was indeed able to increase attentional facets of mindfulness, only socio-cognitive and compassion-based practices led to broad changes in ethical-motivational qualities like a nonjudgmental attitude, compassion, and self-compassion. Obviously, these are troubling symptoms that need to be addressed. There are a number of therapies that have been developed to treat PTSD. One of which, mindfulness meditation training has been found to be particularly effective. But meditation is actually a complex practice involving many different components. One such simple non-meditative component is relaxation and slowed breathing. In addition, there are many different meditation techniques. As a result, it is difficult to know what types of meditation are most effective. It is also difficult to specify if meditation per se or the relaxation and slow breathing that occurs with meditation may be responsible for meditation effects. In today’s Research News article “Mechanistic pathways of mindfulness meditation in combat veterans with posttraumatic stress disorder.” See summary below or view the full text of the study at: https://www.ncbi.nlm.nih.gov/pmc/articles/PMC4803530/, Wahbeh and colleagues investigate different components of meditation and the route of their effectiveness, psychological or physical. They recruited combat veterans who had an established diagnosis of posttraumatic stress disorder (PTSD) and randomly allocated each to one of four conditions; body scan mindfulness meditation, slow breathing with a biofeedback device, mindful awareness of the breath with an intention to slow the breath, or 4) sitting quietly. They were trained once a week for 6 weeks and were assigned to practice 20 minutes per day between sessions. The participants were measured before and after training for mindfulness, PTSD symptoms, lifetime trauma, combat experience, perceived symptom improvement, intrusive thoughts, perceived stress, depression, positive and negative emotions, self-efficacy, sleep quality, and attentional ability. They also received physical measures with electroencephalogram (EEG), salivary cortisol, heart and respiration rates. They found after training that the 2 mindfulness meditation conditions produced significantly greater mindfulness, perceived symptom improvement, the greatest improvements in PTSD symptoms, and greater reductions in respiration rates. Hence, the inclusion of meditation was critical for symptomatic improvement. But, the improvements were all psychological. In general, there were no differences in physiological measures, except for slowed breathing in meditation. The study’s strength was that it separated components of meditation practice and identified the effective components. Mindfulness meditation appears to improve the psychological symptoms of posttraumatic stress disorder (PTSD). It appeared to do so, independent of relaxation and physiological changes. So, physical relaxation or physiological changes are not sufficient. The study suggests that the inclusion of meditation practice is mandatory in order to treat PTSD. Since meditation is known to improve emotion regulation and attention, reduce stress responding, and reduce worry and rumination, the study suggests that these psychological effects of meditation are crucial to symptom relief for PTSD sufferers. So, improve posttraumatic stress disorder (PTSD) symptoms with mindfulness meditation. This study’s objective was to evaluate the effect of two common components of meditation (mindfulness and slow breathing) on potential mechanistic pathways. 102 combat veterans with posttraumatic stress disorder (PTSD) were randomized to: 1) the body scan mindfulness meditation (MM), 2) slow breathing (SB) with a biofeedback device, 3) mindful awareness of the breath with an intention to slow the breath (MM+SB), or 4) sitting quietly (SQ). Participants had six weekly one-on-one sessions with 20 minutes of daily home practice. The mechanistic pathways and measures were: 1) Autonomic Nervous System: hyperarousal symptoms, heart-rate (HR), heart-rate variability (HRV); 2) Frontal Cortex Activity: Attentional Network Task (ANT) conflict effect and event-related negativity, and intrusive thoughts; and 3) Hypothalamic-pituitary-adrenal axis: awakening cortisol. PTSD measures were also evaluated. Meditation participants had significant but modest within-group improvement in PTSD and related symptoms although there were no between-group effects. Perceived impression of PTSD symptom improvement was greater in the meditation arms compared to controls. Resting respiration decreased in the meditation arms compared to SQ. For the mechanistic pathways 1) Subjective hyperarousal symptoms improved within-group (but not between-group) for MM, MM+SB, and SQ while HR and HRV did not; 2) Intrusive thoughts decreased in MM compared to MM+SB and SB while the ANT measures did not change; and 3) MM had lower awakening cortisol within-group but not between-group. Treatment effects were mostly specific to self-report rather than physiological measures. Continued research is needed to further evaluate mindfulness meditation’s mechanism in people with PTSD. Two types of meditation are the most commonly used practices for research purposes In focused attention meditation, the individual practices paying attention to a single meditation object, frequently the breath or a mantra, and learns to filter out distracting stimuli, including thoughts, to stay focused on the present moment, filtering out thoughts centered around the past or future. On the other hand, in open monitoring meditation, the individual opens up awareness to everything that’s being experienced regardless of its origin. These include bodily sensations, external stimuli, and even thoughts. The meditator just observes these stimuli and lets them arise, and fall away without paying them any further attention. Telles and colleagues review the published literature (eight studies) on the differences in the effects of focused attention meditation and open monitoring meditation. They found quite interesting differences. Focused attention meditation tended to produce greater improvements in attentional ability while open monitoring meditation tended to produce larger changes in the physiology, specifically decreased activity in the sympathetic division and increased activity in the parasympathetic division of the autonomic nervous system. The sympathetic division tends to produce greater physiological arousal, including heart rate and blood pressure increases while the parasympathetic division tends to produce greater physiological relaxation, including heart rate and blood pressure reductions. The published research, then, reflects considerable difference in the effects of these two meditation types. It should not be surprising that practicing focusing attention results in improved attentional ability. But, the difficulty in actually focusing attention may be somewhat stressful. Simply allowing whatever arises to come into consciousness, on the other hand may be much more relaxing. The differences in the effects of these meditation techniques suggest that focused attention meditation may be more appropriate for enhancing attention and thought for perhaps the treatment of attention deficit disorder or aging produced reductions in cognition. On the other hand open monitoring meditation may be more appropriate for the treatment of stress related disorders. So, focus in meditation for cognitive effects but open monitor in meditation for physical effects. Attention is an important part of the process of meditation. Traditional Yoga texts describe two stages of meditation which follow each other in sequence. 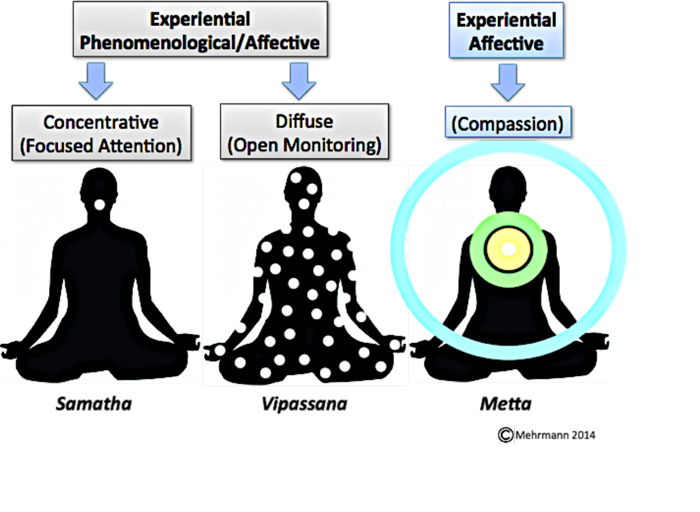 These are meditative focusing (dharana in Sanskrit) and effortless meditation (dhyana in Sanskrit). This review evaluated eight experimental studies conducted on participants in normal health, who practiced dharana and dhyana. The studies included evaluation of autonomic and respiratory variables, eLORETA and sLORETA assessments of the EEG, evoked potentials, functional magnetic resonance imaging, cancellation task performance and emotional intelligence. The studies differed in their sample size, design and the method of practicing dharana and dhyana. These factors have been detailed. The results revealed differences between dharana and dhyana, which would have been missed if the two stages of meditation had not been studied separately.